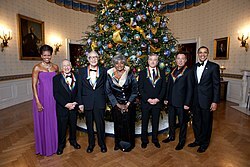 The Kennedy Center Honors is an annual honor given to those in the performing arts for their lifetime of contributions to American culture (regardless of their citizenship). The honors have been presented annually since 1978, culminating each December in a star-studded gala celebrating the honorees in the Kennedy Center Opera House. Logotype symbolizing "a spectrum of many skills within the performing arts"
Lifetime contributions to American culture through the performing arts. George Stevens Jr. created the Kennedy Center Honors with the late Nick Vanoff, and produced the first gala in 1978. He was the producer and co-writer through the 2014 awards, after which he sold the production rights to the Kennedy Center. George [Stevens] came to us with this. What turned us on is that this is the only show of its kind. In Europe and most countries, they have ways of honoring their actors and their athletes. England has its command performances for the queen. We see this as a national honoring of people who have contributed to society, not someone who happens to have a pop record hit at the moment ... Our intention is not to do just another award show. We're going to make an effort in terms of a real special. The first host was Leonard Bernstein in 1978, followed by Eric Sevareid in 1979 and Beverly Sills in 1980. Walter Cronkite hosted from 1981 to 2002 and Caroline Kennedy hosted from 2003 until 2012. Glenn Close hosted in 2013 and Stephen Colbert hosted from 2014 to 2016. There was no formal host in 2017, though Caroline Kennedy delivered an introduction. In 2018, Gloria Estefan hosted. Ricky Kirshner and Glenn Weiss of White Cherry Entertainment were selected as Executive Producers of the 38th annual Kennedy Center Honors (2015) after George Stevens, Jr. stepped down. This is one of the few awards shows that does not air live (with the exception of closed-circuit venues), but a re-edited version lasting approximately two hours is normally televised on CBS after Christmas. Honoree recommendations are accepted from the general public, and the Kennedy Center initiated a Special Honors Advisory Committee, which comprises two members of the Board of Trustees as well as past Honorees and distinguished artists. The Executive Committee of the Board of Trustees selects the Honoree recipients based on excellence in music, dance, theater, opera, motion pictures or television. The selections are typically announced sometime between July and September. The invitation-only weekend-long ceremony includes the Chairman's Luncheon, State Department dinner, White House reception, and the Honors gala performances and supper. Surrounded by the Honorees, the luncheon is held on Saturday at the Kennedy Center, with a welcoming speech by the Chairman of the Board of Trustees. At that evening's reception and dinner at the State Department, presided over by the Secretary of State, the Honorees are introduced and the Honors medallions are presented by the Chairman of the Board. The wide rainbow-colored ribbon then hung around the necks of the recipients, and prominently noticeable when the events are televised, symbolizes "a spectrum of many skills within the performing arts" according to creator Ivan Chermayeff. 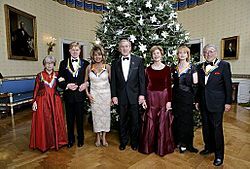 On Sunday, there is an early-evening White House reception hosted by the President of the United States and the First Lady, followed by the Honors gala performance at the Kennedy Center and supper. For the 2015 gala performance, President Barack Obama did attend, after addressing the nation in a live telecast. There have been four occasions where the President did not attend the gala performances: President Jimmy Carter did not attend the December 1979 gala performance during the hostage crisis, President George H.W. Bush did not attend in December 1989 and President Bill Clinton did not attend in 1994. On August 19, 2017, the White House announced that President Donald Trump and the first lady, Melania Trump, had decided not to participate in events honoring recipients of the 2017 Kennedy Center Honors awards to "allow the honorees to celebrate without any political distraction." President and Mrs. Trump did not attend the 2017 ceremony, held on December 3, 2017. Caroline Kennedy was the hostess and presented the honorees. The traditional dinner at the State Department on the Saturday evening before the ceremony was hosted by Secretary of State Rex Tillerson and the White House reception was canceled. There have been 217 recipients to date of the Kennedy Center Honors Awards during the Honor's 40 years (as of 2018), although the one given to Bill Cosby in 1998 was rescinded in 2018, following his sexual assault conviction. The vast majority have been bestowed on individuals. On ten occasions since 1985, awards have been presented to duos or groups, including three married couples who were actors: Hume Cronyn and Jessica Tandy, Paul Newman and Joanne Woodward, and Ossie Davis and Ruby Dee. The dancers Fayard Nicholas and Harold Nicholas of the Nicholas Brothers were honored, along with three musical theater songwriting duos: Alan Jay Lerner and Frederick Loewe, Betty Comden and Adolph Green, and John Kander and Fred Ebb. The musicians of three rock groups were also awarded: Pete Townshend and Roger Daltrey of The Who, John Paul Jones, Jimmy Page and Robert Plant of Led Zeppelin, and Don Henley, Timothy B. Schmit, Joe Walsh and (posthumously) Glenn Frey of the Eagles. The 2018 award ceremony presented the honor, for the first time, to the creators of the musical Hamilton: Lin-Manuel Miranda, Thomas Kail, Andy Blankenbuehler and Alex Lacamoire for "trailblazing creators of a transformative work that defies category." Pianist Vladimir Horowitz was to be an honoree, but the selection committee withdrew the offer when Horowitz conditioned his acceptance on being honored alone and at 4 in the afternoon. Actress Katharine Hepburn declined the committee's first offer, though she relented in 1990. Doris Day repeatedly turned down the honors because her fear of flying prevented her from attending the ceremony. When considering Irving Berlin for the 1987 awards because of criticism for overlooking him, the Center was informed that Berlin wanted to be honored only if he surpassed his 100th birthday (which would not be until May 1988). Also, he was in failing health, used a wheelchair following a series of strokes, and could not attend a public event. The Center instead chose to pay special tribute to him at the 1987 Gala. He died in 1989. Paul McCartney was selected as an honoree in 2002, but was unable to attend because of an "inescapable personal obligation," his cousin's previously planned wedding. After initially saying that McCartney's award would be postponed until the following year, the Kennedy Center announced in August 2003 that "Paul McCartney will not be receiving a Kennedy Center Honor." McCartney later became a 2010 honoree. Mel Brooks has stated that he refused the honor when George W. Bush was in office, due to his distaste for Bush's Iraq policy, but Brooks was an honoree in 2009, the first year Barack Obama was President. In November 2015, one month before the actual ceremony, the Eagles postponed their honors until the following year because Glenn Frey had intestinal problems that required major surgery and a long recovery period. Despite their absence, they were still honored in 2015 via a performance of "Desperado" by country singer Miranda Lambert. Glenn Frey died on January 18, 2016, though the Center made him and the three surviving members 2016 honorees. In 2017, Norman Lear announced that he would accept the honors, but would boycott the White House ceremony because of his opposition to President Donald Trump, citing Trump's proposal to end the National Endowment for the Humanities and the National Endowment for the Arts. Lear did attend the 2017 events and ceremony, but Donald and Melania Trump were not present, becoming the first U.S. presidential couple to skip the event, in order "to allow the honorees to celebrate without any political distraction". ^ "About the Honors". John F. Kennedy Center for the Performing Arts. Archived from the original on May 16, 2008. Retrieved October 4, 2015. ^ Harris, Paul (December 7, 2014). "George Stevens Jr. to End 37-Year Run as Kennedy Center Honors Producer". Variety. ^ a b c Crews, Chip (December 27, 2005). "The Honors, Take 2". The Washington Post. ^ Shales, Tom (September 28, 1978). "Crowning America's Culture Superstars". The Washington Post. p. B1. ^ McGlone, Peggy (November 19, 2014). "Stephen Colbert Will Host 37th Annual Kennedy Center Honors". The Washington Post. ^ Park, Andrea (December 27, 2016). "Kennedy Center Honors 2016". CBS News. ^ "Tony Awards Team Chosen". The Washington Post. May 5, 2015. ^ "Kennedy Center Honors 2017: How to Watch Online and on TV, Start Time and Pre-Show". CBS News. December 26, 2017. ^ "2017 Honors" (PDF) (Press release). John F. Kennedy Center for the Performing Arts. December 3, 2017. ^ "Honors". John F. Kennedy Center for the Performing Arts. ^ a b Andrews, Eileen; Hunter, Amanda (July 15, 2015). "Eagles, Carole King, George Lucas, Rita Moreno, Seiji Ozawa, and Cicely Tyson to Receive 38th Annual Kennedy Center Honors" (PDF) (Press release). John F. Kennedy Center for the Performing Arts. ^ Chermayeff, Ivan (December 7, 2008). "Q& A: Ivan Chermayeff, Designer of the Kennedy Center Honors Medal". The Washington Post (Interview). Interviewed by Jennifer Frey. ^ "A Vision in Blue". Mrs. O. December 4, 2011. Retrieved December 30, 2015. ^ McGlone, Peggy (December 6, 2015). "President Obama Will Be Late to Kennedy Center Honors Performance". The Washington Post. ^ McGlone, Peggy (December 6, 2015). "President Obama to Skip Kennedy Center Honors Performance". The Washington Post. ^ Pareles, John (December 25, 1994). "Performers Receive Kennedy Center Awards". Sun Sentinel. ^ "Trump to Skip Kennedy Center Arts Award". The Washington Post. August 19, 2017. ^ a b McGlone, Peggy (December 3, 2017). "At the Kennedy Center Honors, Plenty of Politics Make Up for Trump's Playing Hooky". The Washington Post. ^ "Bill Cosby's Kennedy Center Honors, Mark Twain Prize Revoked". Yahoo!. May 8, 2018. Retrieved May 8, 2018. ^ a b Gans, Andrew (July 25, 2018). "Hamilton Creators Lin-Manuel Miranda, Thomas Kail, Andy Blankenbuehler, Alex Lacamoire Will Receive Special Kennedy Center Honors". Playbill. ^ "Kennedy Center rescinds Bill Cosby's Honors and Twain awards". The Washington Post. May 7, 2018. ^ "Barbara Cook, Neil Diamond, Yo-Yo Ma, Sonny Rollins & Meryl Streep to Receive 34th Annual Kennedy Center Honors". John F. Kennedy Center for the Performing Arts. Retrieved September 6, 2011. ^ Gans, Andrew (September 12, 2012). 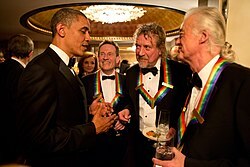 "Dustin Hoffman, David Letterman, Natalia Makarova, Buddy Guy, Led Zeppelin Are Kennedy Center Honorees". Playbill. Archived from the original on November 9, 2012. ^ Gans, Andrew (September 12, 2013). "Martina Arroyo, Herbie Hancock, Billy Joel, Shirley MacLaine and Carlos Santana Are 2013 Kennedy Center Honorees". Playbill. Archived from the original on October 21, 2013. ^ Harris, Paul (September 4, 2014). "Tom Hanks, Lily Tomlin, Sting to Receive Kennedy Center Honors". Variety. Retrieved September 4, 2014. ^ a b "Martha Argerich, Eagles, Al Pacino, Mavis Staples, James Taylor To Receive 39th Annual Kennedy Center Honors" (PDF) (Press release). John F. Kennedy Center for the Performing Arts. June 23, 2016. Retrieved July 25, 2016. ^ a b Clark, Cindy (November 4, 2015). "Kennedy Center Postpones Honors to Eagles". USA Today. ^ Hipes, Patrick (June 23, 2016). "Kennedy Center Honors: Al Pacino, Eagles, James Taylor & More". Deadline. ^ Pollock, Allen. "About Doris". DorisDay.com. ^ Molotsky, Irvin (December 7, 1987). "Five Receive Kennedy Center Honors for Artistic Contributions". The New York Times. 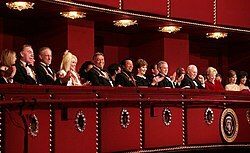 ^ "The Kennedy Center Honors: This Year's Bid for Glamour". The New York Times. August 6, 2003. ^ Trescott, Jacqueline (September 7, 2010). "Oprah Winfrey Among Five Recipients of 2010 Kennedy Center Honors". The Washington Post. ^ "Mel Brooks on His New Box Set and the 1 Million Great Stories that Come with It". Vulture. November 13, 2012. ^ "Mel Brooks: 'I'm An EGOT; I Don't Need Any More'". NPR. ^ "Protest". NPR. August 5, 2017.